1. Always make a good first impression. Let Dottie Hinson show you how it’s done. This first impression is key because it is the only way your friends will be able to identify you in 50 years. 2. When breaking traditional gender roles, know your place. You may be a talented fielder, hitter, or pitcher who has been plucked from a dairy farm in Oregon to play professional baseball,but you are not a ballplayer. You will never be a ballplayer. Because you are a girl and you will always be a girl. 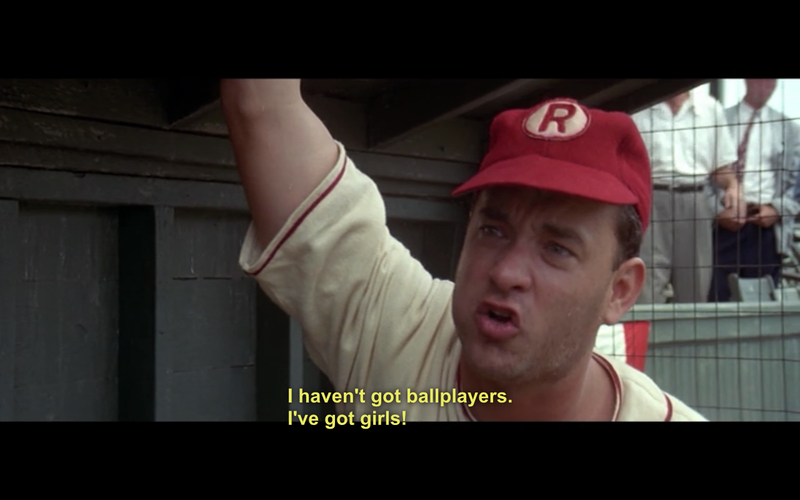 Only Tom Hanks could make Jimmy Dugan a likable character by the end of the movie. 3. Because you are just a girl, you will always be an object. You will be reminded that you are an object every time you put on your baseball uniform and have to use your sexuality to attract ticket holders. Sorry ladies. You’re gonna have to slide in that. 4. Every woman will be objectified. This scene is never not funny. 5. Etiquette training is pointless. This is how a lady should react during pointless etiquette training. This is why Kit is my favorite. Sorry Dottie. You’re kind of unbearable. 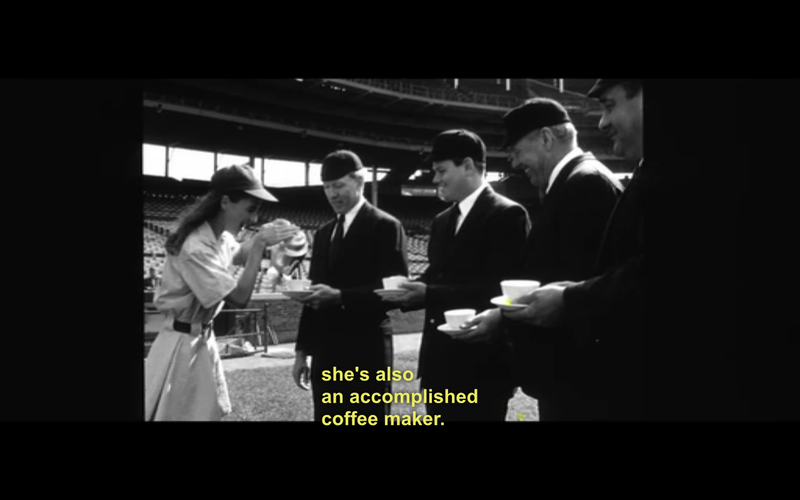 If you are woman, you should be able to play baseball AND knit AND make coffee. That’s feminism. Never underestimate the power of being a skilled coffee maker. 7. Older sisters are terrible. Younger sisters are terrible. Sisters are just terrible in general. Dottie and Kit’s sisterly bond is at the central relationship of the movie, but I’m not entirely sure that they really like each other. Dottie spends so much time treating Kit like crap, you have to wonder what she thinks her pesky little sister will ever be able to take care of herself. I’m a youngest child therefore I agree with Kit on everything. Exhibit A: When Mae shocks a priest. Exhibit B: When Mae wants to distract men with her bosom. 9. Know a good photo opportunity when you see one. Fact: Doing the splits not only improved Life magazine covers but it also saved women’s professional baseball. 10. 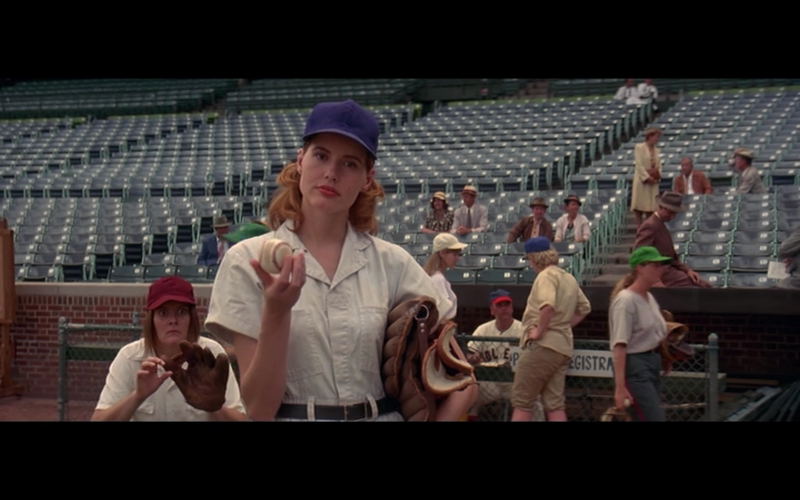 Don’t forget: A League of Their Own is set during World War II. Most of the women had husbands fighting overseas and some of their husbands died. The home front during World War II sucked. 11. Baseball is the only way to be reminded that we are all equal. 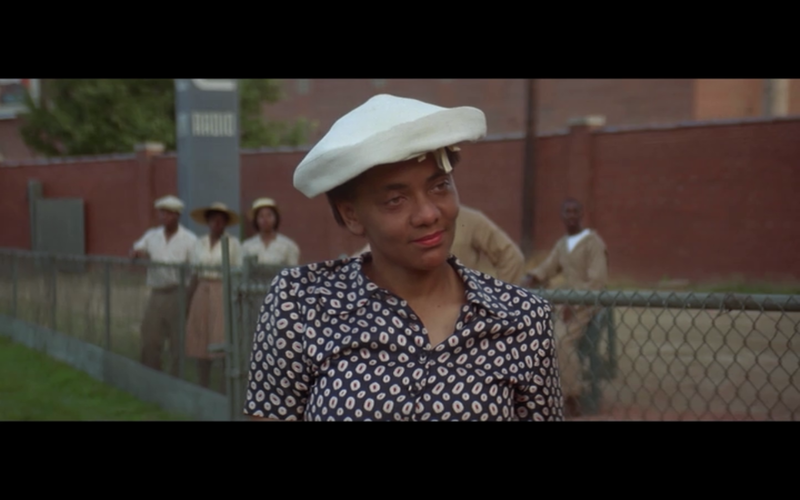 Did you miss the 10 seconds devoted to segregation in 1940s America? How could you? 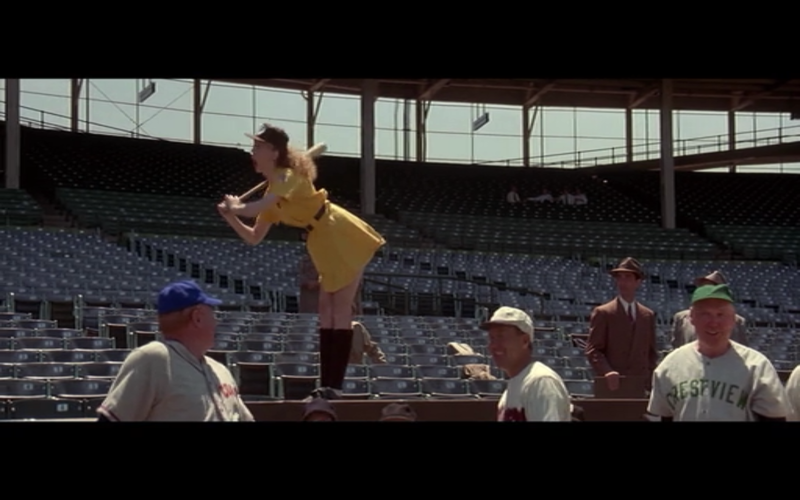 It was a powerful ten seconds when a unnamed black woman tosses a foul ball to Dottie and everyone is amazed by her throwing arm. Because black women can play baseball too. We’re all equal? What a concept. You’re my favorite character, unnamed black woman. 12. We’re all going to get old and die. 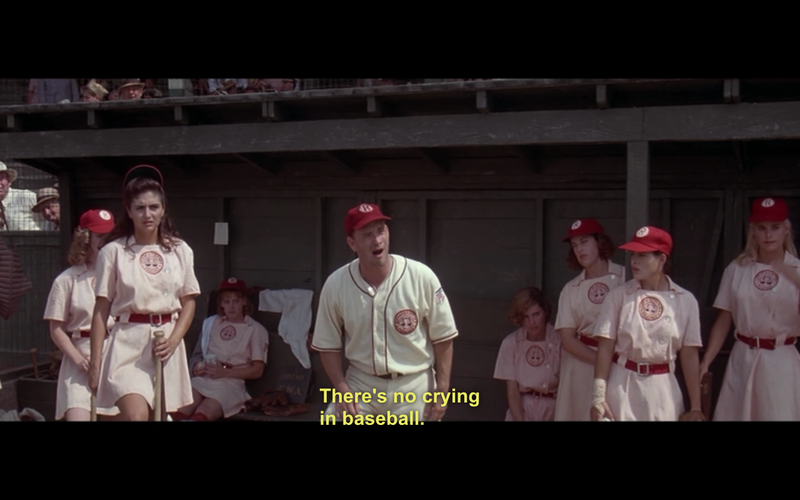 During the last ten minutes of A League of Their Own, I am reduced to a sloppy, crying mess. Every. Single. Time. 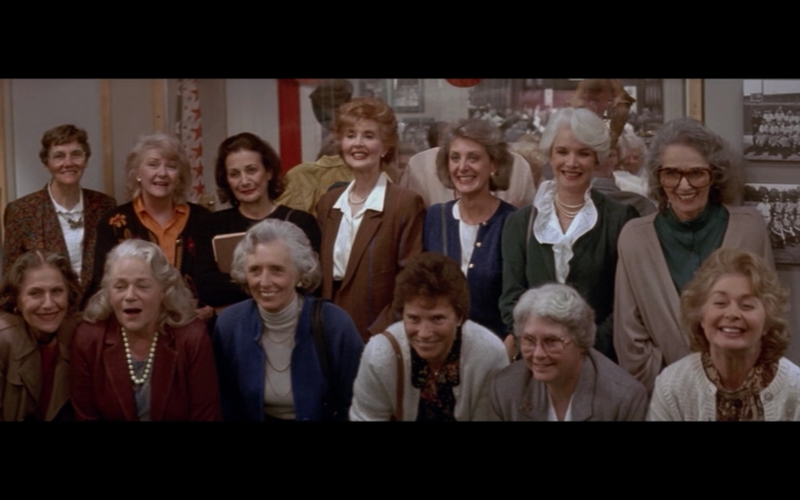 Because the women reunite. And everyone is old or dead. And they sing. 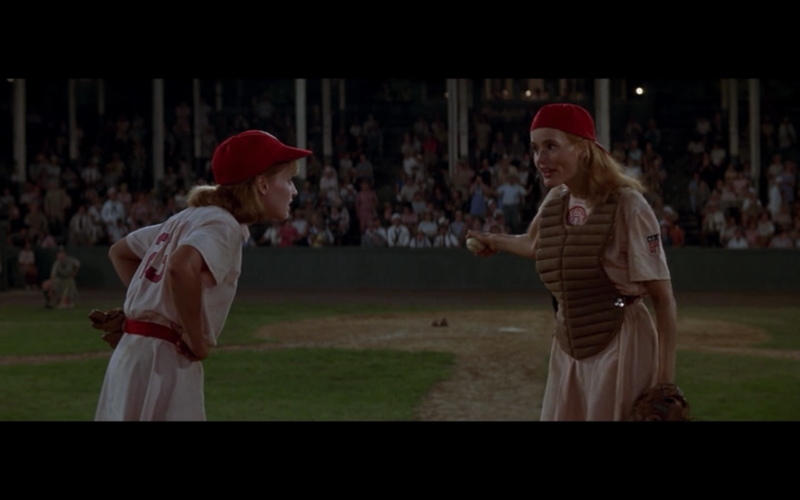 AND THEY HAD A LEAGUE OF THEIR OWN AND IT WAS BEAUTIFUL. 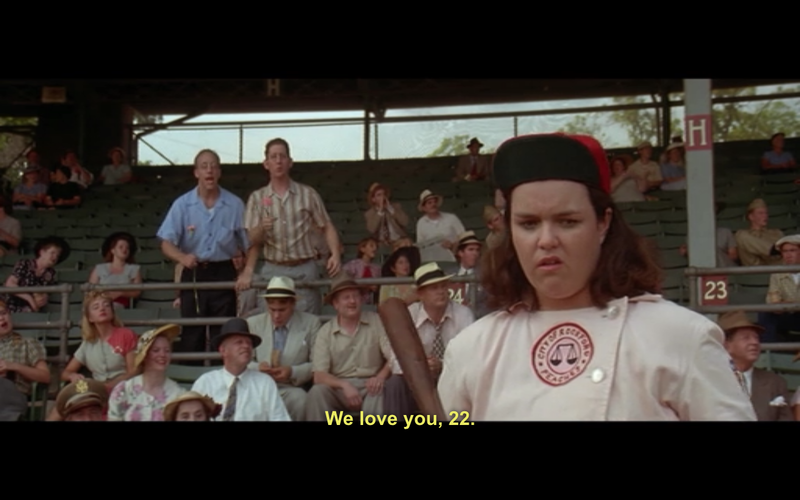 HOW COULD YOU HAVE A LEAGUE OF THEIR OWN POST WITHOUT ANY MARLA HOOCH. Otherwise, check plus. You’re right. That’s an oversight. Marla Hooch teaches us that wallflowers have long and happy marriages. We should all want to be Marla Hooch.